So, my latest project is to actually wire the condo, to get around the slow and unreliable wireless connection and allow faster streaming to the XBox360 and PS3. The last wiring I did (for this same purpose) was in the Oregon house, where I laid Cat5e cables via the roof space. This was relatively straightforward, as I could get up there. But being in a condo means very limited access to the space above the ceiling, and one of my ceilings is twelve feet high. It seemed much simpler to use existing wiring. There are actually four type of existing wires I could use. There’s the power lines, the phone lines, the cable TV lines and the TV antenna lines. The last two are basically the same thing, and luckily this condo is wired (more of less), with two sets of coaxial cables going to each spot where there’s a cable TV outlet. One is the CATV, and the other connects (presumably) to the rooftop antenna, shared by the building. That means it’s basically unused, since we just use cable TV. Power line and phone line networking were discounted because of the slow speeds (10 Mbps, or so I thought, actually 200 is claimed now) and the unreliable nature of unshielded cables being dual-wielded, this leaves the coaxial (128 Mbps), with the obvious choice being the spare set of coaxial cables that can be dedicated to this new network. There are a few competing technologies for this kind of thing, most notably: MoCA, and HomePNA, which comes in two flavors: phone line networking, and coaxial networking, which is sometimes called HCNA. The entire thing seems surprisingly fringe, and I had quite some trouble finding where to buy the equipment. I found a few options, but very few actually for sale. The Highwire seemed more readily available, but is too expensive, and seems like it works in pairs, rather than a broadcast over shared wire. Of the cheaper two that I could actually order online, the HPCE-322M and the DPH548 looked fairly similar. Indeed I would not be surprised if they had the same chip inside. They seem to offer the same set of ports: cable in and out, two ethernet ports, power, a two-position switch (host/client) and some blinkenlights. I decided on the DPH548, swayed by the “In Stock Now”, the nice diagrams of wired house, and the fact that it’s made by a company owned by Cisco. They have a nice little brochure on the adapter. It’s a bit more expensive, but I like to have a modicum of reassurance. I’m slightly concerned that there seems to be only this one obscure store on the internet selling them. It seems like they are restricting sales to installers? I don’t know. Perhaps this technology is just going out of fashion, since more people use wireless. So I’ve ordered three of them. One will sit by the main router in my office, which is connected to the DSL line (hopefully soon to be some kind of FiOS). That one will act as the host. One will sit behind the TV, and will be connected via a switch to the Wii, the PS3 and the 360. The last one will be connected to Holly’s computer. Those will both be configured as clients. Speeds are promised as a sustained 80Mbps. We shall see. That’s actually slower than the best wireless out there (802.11n), but I’m hoping that in addition to being much more reliable, the real-world throughput will work out higher (Wikipedia lists actual 11n throughput as 74Mbps). Now, the diagram on the right here shows the adapter sharing the wiring with the Cable TV system. Apparently this should work just fine, seeing as the DPH548 uses the frequencies in the range of 12-28Mhz, whereas “existing RF Video” is apparently 54-860Mhz). However, I don’t trust this at all, and since I have these spare cable runs, I’m going to put it all on it’s own dedicated cables, disconnected from anything else. I think this will give me a cleaner signal, and prevent any interference with the cable TV. Plus it should give me room to change over to some meatier cable network later. I mean, coaxial cable can theoretically support several Gbps – like with all those cable TV shows in HD. While waiting for them to arrive, I tidied up the wiring I was going to use. There are eight antenna coaxial cables which converge in the wiring closet (actually just a closet) along with the CATV cables. I found the three of them that went to the locations I needed (by plugging in a small TV, and then unplugging cables until the signal went out). I then removed these three cables from the antenna splitter, and connected them all together with a single 3-way splitter. The image above shows the closet. 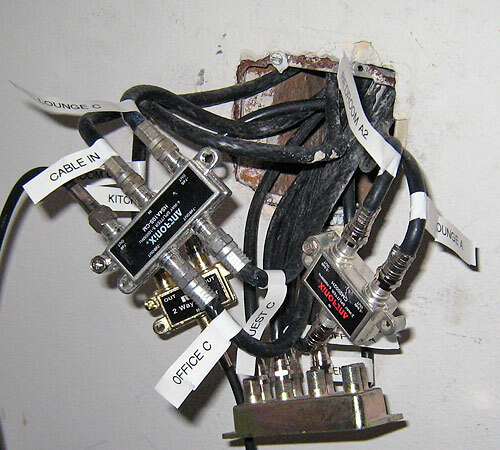 Originally there were two sets of cables: the “C” cables (CATV), which go into the two splitters on the left (for five TVs) and the “A” cables (Antenna), which used to go to the eight-way splitter at the bottom. Here you can see the new splitter on the right, and the three “A” cables I’ve combined into a new network with the 2-Way splitter acting as a 3-way combiner. The adapters were shipped very promptly by NTI. The boxes they are in are labeled “WebSTAR”, which is Scientific Atlanta’s cable modem brand. There’s a sticker on the box that says ETH-COAX, which is what NTI call it, and a handwritten serial number (112). Peeling this off reveals the actual Scientific Atlanta sticker, which looks a bit more reassuring. Made in ’06, I guess this is something they don’t make any more, and is surplus stock? Setup is very simple. I just basically plug everything in. Connect the cable to the “COAX NETWORK” connector, plug the ethernet into the “PC/LAN” port, and connect the power. There’s a switch for host/client, which you don’t have to adjust as it will auto-configure. But I set the one near my router to HOST and the other two to CLIENT. It works! The boxes need about ten seconds to connect after you power them up, then it seems like I have a very solid 70Mbps (about 8MB/sec) Ethernet connection. I timed the speed by copying large files and observing the percentage used in the Process Monitor’s network window. There seem to be no problems at all. I added a switch behind the TV to connect the Xbox 360, PS3, and the Wii, and that seems fine (I still need to get an Ethernet adapter for the Wii). Overall I’m very happy. I’ve replaced a very unreliable slow wireless network with a fast wired network. I’ll still keep the wireless connected to use with the iPhones and laptops. But for the fixed devices, it’s a vast improvement. Of course, now I’ve actually got this set up and working, I discover that powerline ethernet adapters actually go up to 200Mbps now, with 400 planned soon. Grrr! Still, reviews are mixed, and it’s not clear if you’d actually get that 200Mbps (and it’s probably 100Mbps on-way, which is the figure that counts), what with the power lines being unshielded, and having 110 Volts running through them. So I’m still pretty happy with what I’ve got. AD9865BCP 10-Bit Broadband Modem Mixed Signal Front End – the actual PNA interface. 88E6060-RCJ – Closest I could find was LinkStreet 88E6063, 7-Port fast Ethernet switch with 801.1Q. D-Link’s DXN-221 (for a pair) aand DXN-220 (single add-on unit – Soon to be released. Seems like the same basic thing as the DPH548. Previous Post: Sharing Two Kindles, How does it work? Coaxsys is dead and gone. 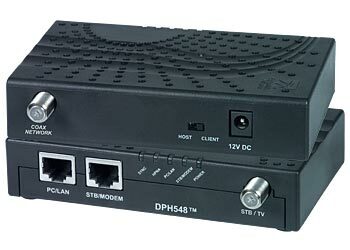 i use the sa dph548 for tv over ip i don’t get good results. Thanks for a helpful article, it’s realy very interesting info for me. My dph548 make happy me and works fine! None of these solutions are capable of reliably streaming High definition video (1920x1080P). Really? I get a solid throughput of 70 Mbps, how is that not enough? BluRay 1920x1080p has a max bitrate of 40Mbps. Well, I’ll see if can give it go sometime, and post the results. Anyone know of good sample media to use? I’m Chris Geiser, the Product Line Manager for the NETGEAR MoCA bridges. The MCAB1001 works fine on the Verizon FIOS network and has been extensively tested. Thanks for the info Chris, I’ll update the article. Ah shame it doesnt steam 1080p well. I was looking forward to using it. Nice post though. 70 mbps is pretty decent – I’ve been tweaking and unable to break the 50 mbps mark so you should be happy! Lol at the coax “before” pic, looks like my outside box. Ethernet over existing TV Coaxial cable. CTC Union’s product EOC 20 & EOC 21 are best ethernet to coaxial LAN extender. TV and ethernet can go on single coax cable. multiple tapping can be donne using tap/splitter. link..